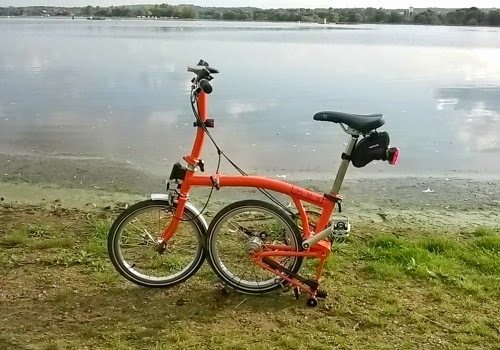 A few years ago I bought a Dahon folding bicycle on Ebay. 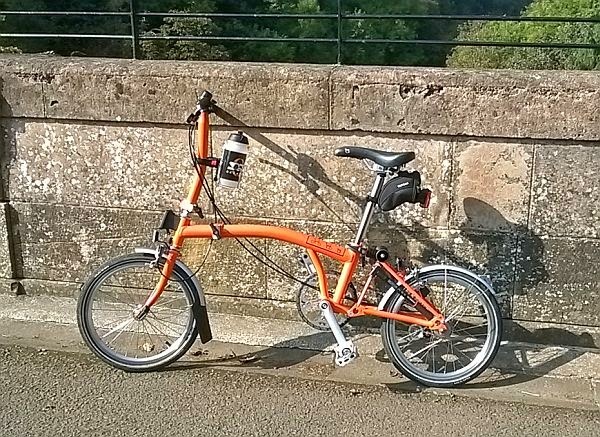 It is badged as a Raleigh bicycle but is made by Dahon. This has been a super bicycle and has taken me around London, Windsor and along the Grand Union Canal. It has also taken me to the Holy Isle (Lindisfarne), the Isle of Bute, Loch Lomond and many other areas in Scotland. The maximum distance I have travelled is 55 miles in one day on it, from Wanlockhead in South Lanarkshire to my home. 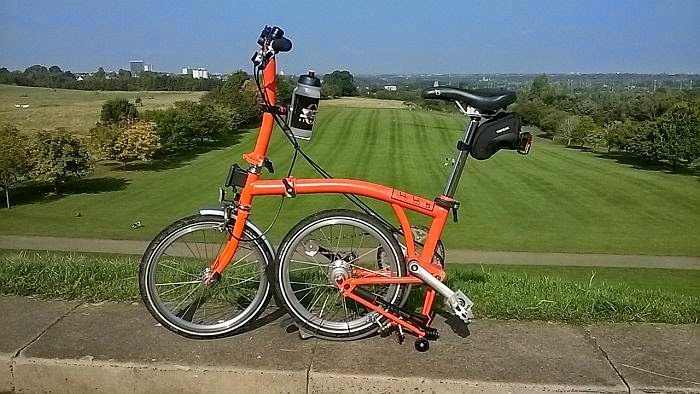 However, I decided to buy a Brompton S3L 2014 because it folds just a bit smaller than the Dahon. The wheels are only 16 inches, but it still provide a smooth and fast ride. 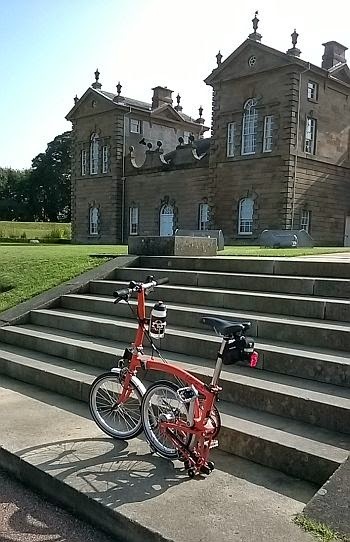 I took it for a spin on the cycle paths around Motherwell and Hamilton, visiting some interesting structures from the former estate of the Dukes of Hamilton. The orange colour is quite distinctive. I wanted red but, they only had orange or white in the style with the 'sports' handlebars. Chatelherault was the former estate of the Dukes of Hamilton. The Hunting Lodge above was built in 1734 for the 5th Duke of Hamilton. The view above was towards Hamilton palace which was demolished in 1927 after suffering subsidence from mine workings. The Dukes Bridge was commissioned by William 11th Duke of Hamilton. It stands 80ft high over the Avon gorge allowing access to the ancient oaks and Cadzow Castle. 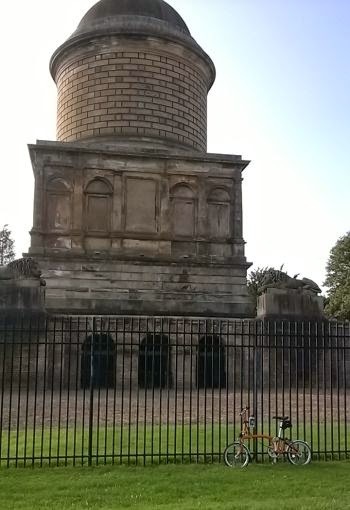 The Mausoleum in Hamilton was the resting place of the Dukes of Hamilton and is situated in the grounds of the former Hamilton Palace. It held the record for the longest echo of any man-made structure in the world. Construction was begun in 1842 and completed in 1858. It was a great way to test my bike and it was a bit of a head-turner as well.